We're still waiting for the actual Civl War figures to show up in stores, but the exclusives have begun to appear. 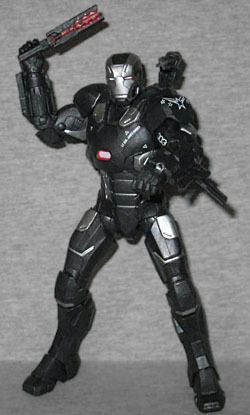 War Machine is ready for action with his battle baton and the best in Stark technology. We first learned about this two-pack a few months ago, when Shocka found a listing for it on some random site. There was no indication where or when it was coming, but the answers turned out to be "Target" and "nowish." It's a bit strange that we have to resort to an exclusive to get War Machine, especially considering he had more of a role in Civil War than in I Still Know What You Avenged Last Summer - there he was a punchline and a gun emplacement, while here he was an actual character, with as much growth as he had in Iron Man 3. It's just too bad that Captain America and Iron Man never stopped to consider that both their best friends were named "James," or they could have stopped fighting. What's really surprising is that this is a completely new mold, not just a repaint. Yes, the design has changed over the years, but wouldn't you expect a store exclusive to cut some corners? Not this one! The armor is very bulky, more like the War Machine Mk.I than the War Machine Mk.II (and definitely way bigger than the Mark 0). The shapes of the armor are generally smooth, just very large. Do you think Tony is the one making all these upgrades for him, or is the Air Force just tinkering with the stolen prototype suit? Either way, this one looks big enough to actually be something protective a human would wear, not just skin-tight metal. 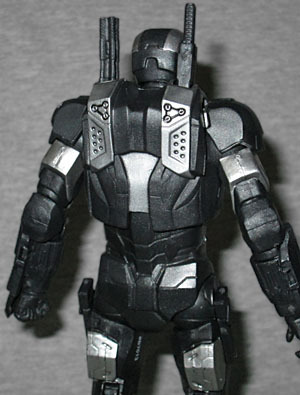 War Machine is dark grey with silver accents, as he usually is. You do want to check the paint before you buy this set, though: the tiny white text on his chest can get blurry, leaving you unable to read his name. There's a symbol on his left shoulder that's similar to the Air Force logo, a few small white triangles on the chest, and a large 003 on his left arm. The chest beam and the eyes are red, though those can get a little uneven as well. In the film, he has kill tally marks on the right side of his chest, but those are absent here. 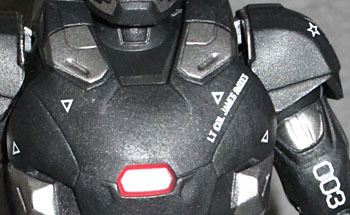 Since, at this scale, they'd be little more than plain dots (they represent Ultron Drone heads), you could easily add them yourself if you want them. He's got a full complement of articulation as well, moving at the head, shoulders, biceps, elbows, wrists, torso, hips, thighs, knees and ankles. The shoulder pads on the armor still attach to the trunk with those weird hinges that do nothing to support the range of motion of the arms, and the ankles barely have room to move at all. We'd say that the armor on his thighs keeps the hips from moving very far, but only in terms of action figures - they have a perfectly reasonable human range of motion. The accessories are cool, too. First we have an alternate set of hands: closed fists, rather than open to hold things. There's a four-barreled gun on his left shoulder, with a hinge and a pivot for aiming. As mentioned in the bio, he inclues his "battle baton," a melee weapon for use against targets he doesn't want to kill. The design of the toy is different from the one seen in the movie, but only because of changing prouction design: Hot Toys' super-expensive version is the same as this one. 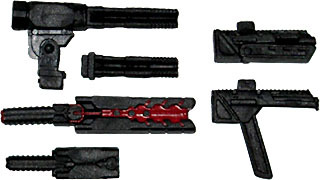 For maximum coolness, the set includes "retracted" versions of both those weapons that fit in slots in the armor's shoulders. Neat! While the guns on (and under) his forearms can't pop up like they do in the movie, he does have a pair of submachine guns that can either plug into the side of his arm or, with the magazine folded away, store on his thighs. Impressive! 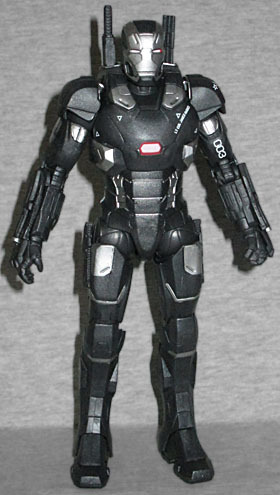 Iron Man enters stealth mode with the camouflaging capabilities of the Mark 27 armor. Really, Hasbro? 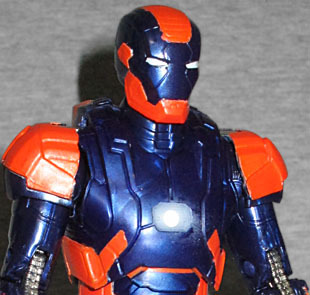 You have 42 armors to choose from, we still don't have a 6" Mark 7 (the one he got in the first Avengers), and you choose to make the Disco armor? That's not us being disparaging, by the way - the official name of the Mk. XXVII is "Disco," just like the Mk. XVII is Heartbreaker and the Mk. XLIV is Hulkbuster. The name, coupled with the garish colors, may make you think we're just calling it that in honor of the (in)famous Mo2K "Disco Skeletor," but no, if there's such a connection to the name, it's one that was made by the designers, not by the fans. Some of the "House Party Protocol" armors had logical names and colors, but this is most definitely not one of them. 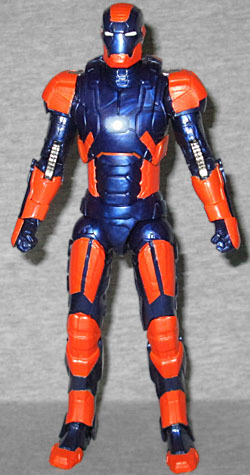 For some reason, this figure is a repaint of the Iron Man 3 James Rhodes figure - you know, the one that was painted up in Iron Patriot colors. That's a rather unexpected choice. If you look at the actual design of the suit, you'll see it (like many of the blink-and-you'll-miss-'em IM3 armors) shares its basic shapes with the Mk. VII; just another reason we should have gotten one of those by now. The toy does a decent job of re-creating the Disco deco, even though the colors have to be applied to the wrong shapes. The blue is that swirly metallic plastic, while the orange is full and vibrant. 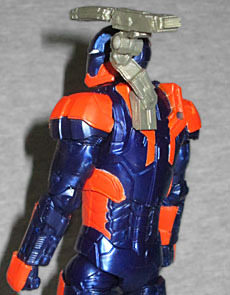 The figure moves just like the previous two releases of the mold, and because it was included in the tooling, we still get the shoulder-mounted gun (though it makes no sense for a chameleon suit to need heavy armaments). War Machine is great, but the fact that you have to buy Disco to get him brings the value down a bit. On the plus side, if you only want Disco? You'll probably be able to pick one up dirt cheap on eBay.